I bought red miso paste this weekend to use in a new recipe. Yes, this is another “specialty” ingredient that I anticipate using only occasionally. So why didn’t I resist the urge and skip this recipe? Well, upon seeking out the item at Fairway, I found one brand, which came in a jar. I inspected the label and read “Refrigerate and keep indefinitely.” How perfect! I know what I’ll be making next! As a side note, this week is Earth Week, and I hope it caused you to pause for a moment here and there to think about how you can consume less and reduce waste. The newest step I am going to take is to purchase a rain barrel that will capture rainwater I will then use for my garden this summer. 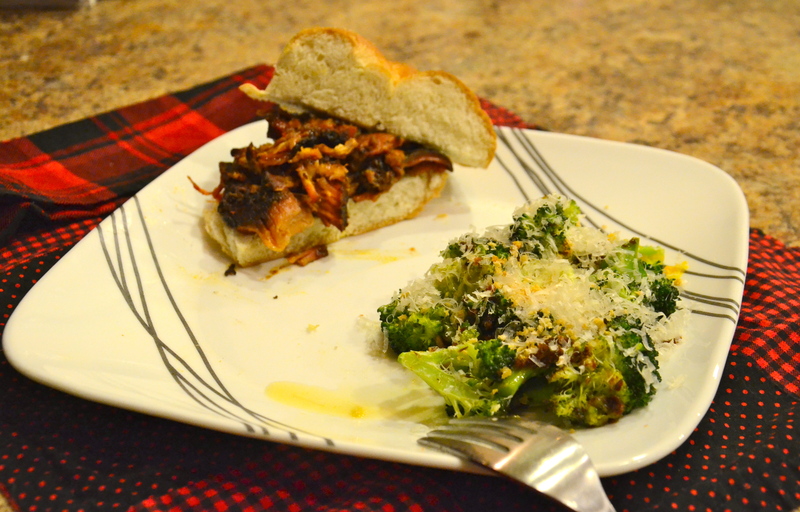 Back to my “earthy” meal: I picked this unusual recipe merely because I had a head of fresh broccoli leftover. Anther head had been prepared via the simple and boring – yet still tasty – method of steaming, and served alongside pasta. This was my first encounter with Bagna Càuda, and had I not looked into it further, I would have assumed it is always made with miso paste. But I learned that it is an Italian dish, specifically Pietmontese, made and served similarly to a fondue for dipping (Italian) vegetables like carrots, fennel, and artichokes. The name means “hot bath,” and usually involves olive oil, garlic, and anchovies, and sometimes incorporates butter or cream. It sounds comforting and delicious; why is this the first I’ve heard of it? Well for starters, perhaps I should have continued my subscription to Bon Appetit … Ironically, my reading loyalty has instead gone to Cooking Light . I love the folks at Tasting Table, but their style of writing recipes in this particular series annoys me. They write that the recipe yields two servings, plus leftover bagna càuda that can be refrigerated for up to a month. But they don’t tell you how much bagna càuda to put on your two servings of broccoli, and how many servings you will have left over! The original bagna càuda subsection of this recipe called for 4 sticks of butter. Needless to say, I cut that down to one, and made sure that I had leftovers from that. Serving size: at least 3 servings as a side-dish. It really depends on what you consider to count as one serving of a broccoli dish! 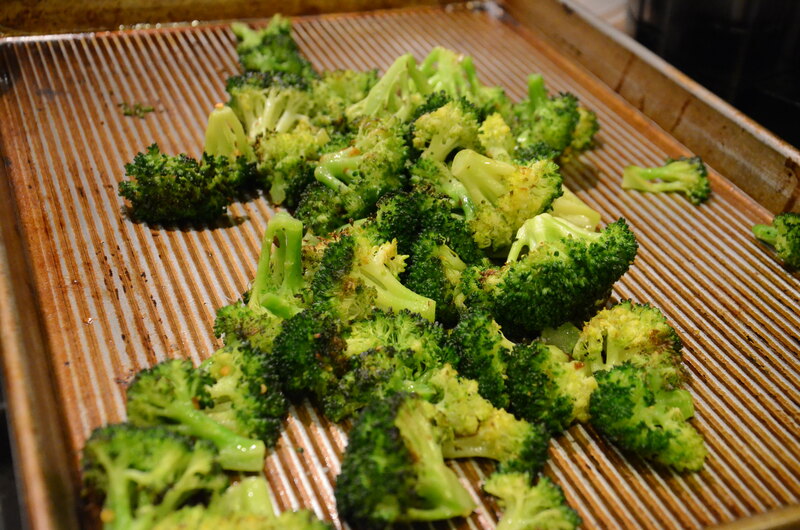 Make the broccoli: Place a baking sheet in the oven and preheat the oven to 475°. This is when a little alarm goes off in my head to turn on the hood van in the kitchen, and/or open some windows. 9 times out of 10 that I use my oven at more than 400°, and especially when the broiler is involved, you can expect the smoke alarm to go off. Then it’s off to the dining area with a chair and a towel, waving frantically in the air while attempting to simultaneously plug at least one of my ears. I hope I’m not the only one. 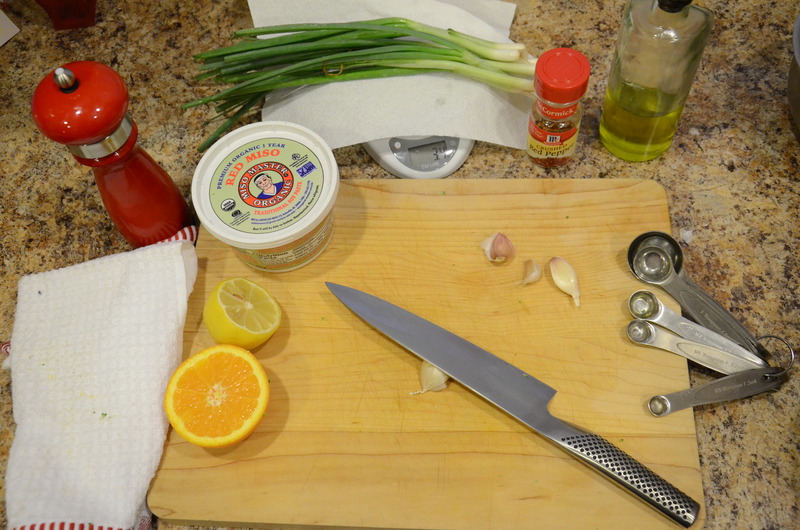 To a large mixing bowl, add and mix together the first 5 ingredients (through red pepper). Carefully remove the baking sheet from the oven (mine was in the oven for about 10 minuets) and add the broccoli to the baking sheet, shaking the pan to evenly distribute. Return to the oven and roast until the broccoli is charred and tender, 5 to 7 minutes. Transfer broccoli from baking sheet back into the mixing bowl. Add panko to baking sheet, and place in oven, which has been turned OFF, for about 5 minutes until toasted. The leftover heat should be enough. Make the bagna càuda: To a large saucepan set over medium heat, add the butter. Once the butter begins to melt, add the garlic and scallions. Whisk to combine. Once the garlic is very fragrant and lightly toasted, after about 5 minutes, turn the heat down to very low or off and whisk in the red miso paste. 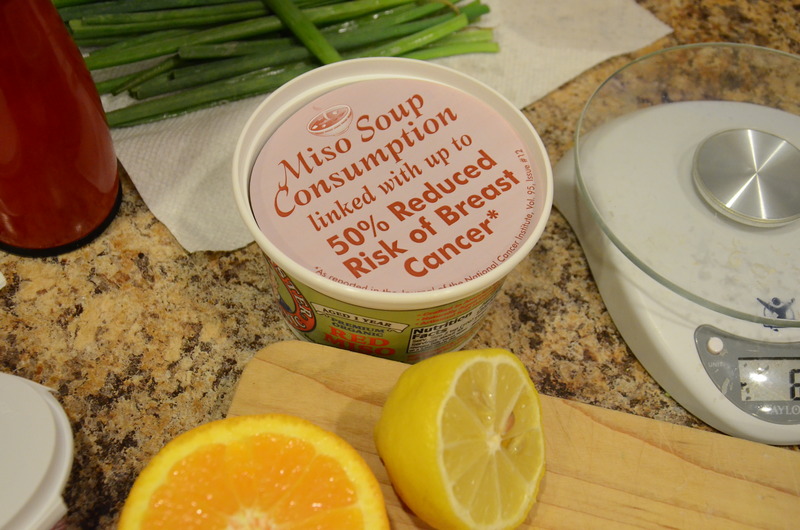 I read elsewhere that miso paste has a very bitter taste if burned, so it is important to avoid a high boil. While whisking, drizzle in 2 heaping tablespoons of extra-virgin olive oil. 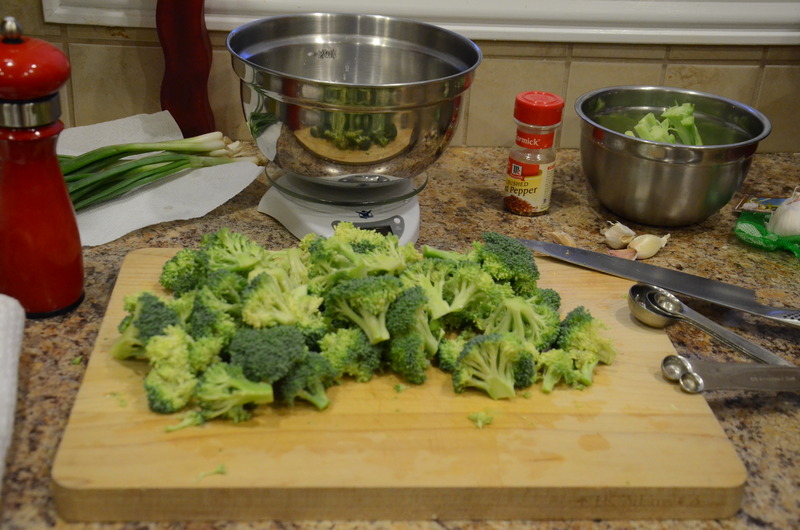 Transfer broccoli to serving bowl, or individual plates. Spoon the bagna càuda over the broccoli. Serve sprinkled with the zest and juice, grated Parmesan cheese, and toasted breadcrumbs (if using). I served mine with half a pulled pork sandwich with Dinosaur Barbecue sauce, the leftovers from Matt’s Sunday session with our smoker. This entry was posted in Orange Juice, Vegetables and tagged Broccoli, Orange Juice, Red Miso Paste, scallions. Bookmark the permalink.